No food history today. Today's recipe comes from my favorite lady Paula Deen. I was watching Paula's Home Cooking and she was making Low Country Smothered Pork Chops. The recipe look so easy to make. No knife needed, Paula was cutting the pork chops with her fork. So you know they are tender and moist. And the bell peppers and onions are so tasty. So I had to give them a try, so glad I did. Yum factor! I just adore Paula Deen and her family. I love her sunny personality and her laugh. Her humor makes me laugh. I enjoy trying different recipes from her cookbooks, her shows and her website. Her recipes are to die for. Not only is she a great cook, but she is honest. Paula is a true southern lady. She puts her family first. She never forgets where she came from. Paula works hard. I'm addicted to the Food Network and The Cooking Channel. Paula Deen is one of my favorite cooks. Paula says... she isn't a chef she's a cook. I just love her. Season pork chops with salt and pepper. Melt the butter in a skillet over medium heat. Lightly roll the chops in flour, shake off the excess, and slip them into the pan. Brown, about 3 minutes per side, remove them to a plate. Add the bell pepper and onion, to the skillet, and saute until tender, about 3 minutes. Push the vegetables to the side of the skillet. 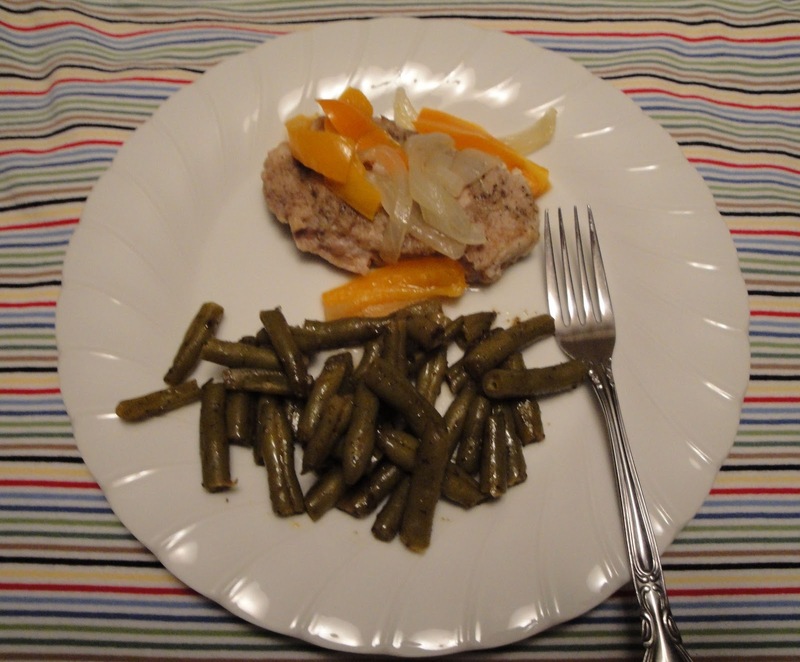 Add pork chops to skillet and place vegetables on top of pork chops. Pour in the broth, sprinkle Worcestershire sauce, add garlic and Louisiana hot sauce. Cover pan with foil and simmer for 45 minutes or until chops are tender. Enjoy! These sound great Christine! We are major pork lovers here and I love when it's cooked until fork tender so this is a definite try. Mmm...smothered pork chops. I'm drooling! Whenever I flip the channel and see that Paula Deen is on, I just have to wait 'till I hear her say "y'all," and then I end up watching the rest of the episode. Pork Chops! 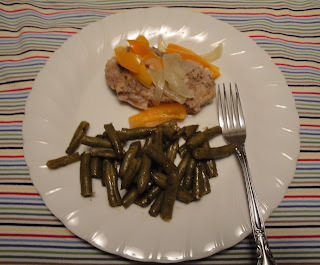 I like the idea of cooking the pork chops and smothering it with vegetables in a covered pan. I can imagine the combining flavors once done. Great recipe! Very interesting. That's one way to slow cook on the over and keep the moisture in with the foil. Preparation is the key to good pork chops because they can turn out dry. Your recipe does sound like they would be wonderfully tender and moist. I will need to try this-well done. Gotta love Paula!! These pork chops sound fabulous! I love Paula Deen also, she's very genuine. Thank you for sharing this recipe, I also love pork chops. Thanks for stopping by. Means a lot to me. Looks delicious - you can't go wrong with Paula Deen! Looks good Christine, good recipe from Paula Deen. Paula is a woman who knows how to make comfort food, that's for sure. These pork chops look fantastic. And, if you can truly cut them with a fork, they're heading to the top of my to-make list! I eat a lot of pork too and this dish looks so delicious! You can truly cut them with a fork. They were awesome. And healthy to. You should try this recipe. Oh man I love pork chops. I can rarely eat them as it's a ibs trigger though. Every now and then I indulge in some pork and this is what I go for. Pork chops are so good. Yours look so tender and moist. My mouth is just watering. I was craving fish but now that craving is heading over to pork. I know these taste delicious. Paula creates some really good food. She is very honest about what she is producing. I don't know Paula Dean, but she sounds very nice. :) Love pork and this is very easy. Like Paula Dean's recipes too. The pork chop looks really tender and tasty. I tried making these last week and they were sooo yummy! I would have never thought to use Worcestershire sauce with pork chops, but they came out really good - even though I was working with less than ideal ingredients on some levels lol. I don't remember it calling for the hot sauce though. Must have overlooked it, but I'm sure that would have added another layer of flavor too!